DSM is a leading global supplier of vitamins, carotenoids, nutritional lipids, nutraceutical ingredients and nutritional premixes to the dietary supplement, food and pharmaceutical industries. With customized support throughout the entire new product development process, we help our customers get to market faster and safer with appealing solutions that work. Nutrition science is at the core of DSM. We are committed to addressing the requirements of people around the world in need of nutritional solutions. Through science, partnerships, communication and advocacy, our Nutrition Science & Advocacy team aims to raise awareness of sound scientific evidence for the role of micronutrients in nutrition, health and wellbeing. The aim of this webinar channel is to provide up-to-date information on the role of micronutrients in supporting human health. Together with guest speakers, our experts deliver relevant discussions on today’s prominent health concerns and highlight key scientific findings on micronutrients and their role in supporting specific health benefits. Does better nutrition need to be expensive? The United Nations Sustainable Development Goals (SDGs) have catalysed action among stakeholders across the public and private sectors. Now more than ever, leading companies are interested in sustainability as a business driver instead of a ‘check the box’ exercise. Working together in partnership to bring better nutrition to people around the world will be essential to achieving the SDGs, especially Goals 2 and 3 “Zero Hunger and “Good Health and Well-being”. With roughly 70 percent of the world’s malnourished children living in Asia, it’s an area that needs extra attention. 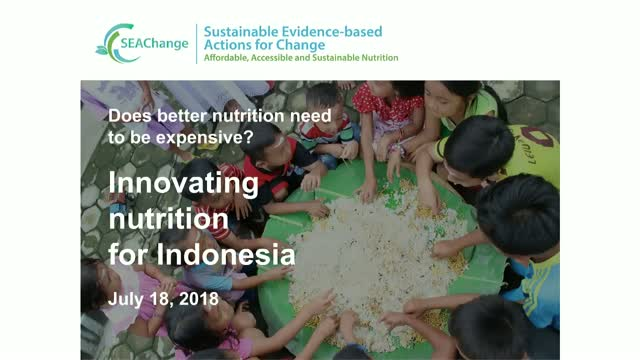 This inaugural SEAChange webinar will look at innovative solutions for better nutrition in Southeast Asia, especially in Indonesia – where many live on less than 5 USD a day. We will look at ways that food companies can develop financially sustainable business models to provide affordable nutritious food products to low- and middle-income consumers in Indonesia. The webinar will also review nutritional status of Indonesia people and current government interventions. Join us for our first webinar on brain health, presented by Professor David Smith, Department of Pharmacology, University of Oxford, who is accompanied by DSM’s Manfred Eggersdorfer, Professor for Healthy Ageing at the University Medical Center Groningen, and Brent MacDonald, Director Global Marketing, Nutritional Lipids. With an increasingly aging population, brain health is a greater concern for consumers, as well as the medical and scientific communities than ever before. This can manifest in individuals of all ages, from impaired brain development in early life, to increased risk of cognitive decline in the elderly population. Evidence continues to highlight the role that good nutrition can play in protecting brain health. Key nutrients, such as nutritional lipids, have been shown to be important in supporting fetal brain development and in slowing the rate of brain atrophy in older adults. Nutritional lipids are crucial components of the brain, and B vitamins may have a disease-modifying effect in the prevention of cognitive decline. B vitamins and omega-3 fatty acids also interact to protect the aging brain. The webinar will present the latest research and current trends in brain health. The experts will then discuss the importance of nutrition in supporting brain health and explore the impact of long-term nutritional intervention as a valid approach to the prevention of dementia. Join us for our first webinar on lipids and oncology, presented by Dr. Catherine Field and Dr. Robert Chapkin, two of the world’s leading experts in the molecular mechanisms by which lipids modulate cancer risk and therapy. Together with DSM’s Dr. Keri Marshall, they will discuss the evidence for the use of lipids, particularly eicosapentaenoic acid (EPA) and docosahexaenoic acid (DHA), as a part of neoadjuvant therapy for two of the most common cancers: breast and colon. In 2017, there will be an estimated 1,688,780 new cancer cases diagnosed and 600,920 cancer deaths in the US alone. By 2030, the global burden is expected to grow from 14.1 million new cancer cases and 8.2 million cancer deaths worldwide in 2012, to 21.7 million new cancer cases and 13 million cancer deaths, simply due to population growth and longer lifer spans. The future burden may be even larger due to the adoption of certain habits common in Western lifestyles, such as smoking, poor diet, and physical inactivity. Lipids, in particular EPA and DHA, have been shown to play a role in both prevention and treatment of multiple forms of cancer. The webinar will explore the current state of the science for EPA and DHA as a bioactive, including novel research in human cell lines, that show evidence in preclinical models using patient derived xenographs. It will also provide an overview on the potential mechanisms as to how DHA may improve neoadjuvant chemotherapy, while protecting healthy cells. Join us for our first webinar on heart health, presented by Prof Carl "Chip" Lavie who will be joined by DSM’s Dr Keri Marshall and Prof Manfred Eggersdorfer. Together they will discuss the latest research into the area and examine how nutritional strategies may improve heart health across the world. Cardiovascular disease (CVD) is one of the biggest threats to human health, responsible for approximately 17.5 million deaths every year. Today, extensive research on key nutrients, including omega-3 eicosapentaenoic acid (EPA) and docosahexaenoic acid (DHA) and vitamin D, indicate micronutrients have an important role in heart health and reducing the risk of CVD. Looking at omega-3 fatty acids, scientific data indicates that EPA and DHA play a role in the prevention of CVD. Through a complex set of actions EPA and DHA act to beneficially modify a number of risk factors for CVD including blood pressure, platelet reactivity and thrombosis, plasma triglyceride concentrations, vascular function, heart rate and heart rate variability, and inflammation. The webinar will first focus on EPA and DHA in supporting heart health and slowing the progression of cardiovascular disease, and then explore the substantial role of vitamin D in reducing the risk factors associated with various cardiometabolic conditions. Across the globe, omega-3 intake is lower than recommended. This means a large proportion of the population is missing out on the wide range of health benefits offered by omega-3s. Omega-3s have been linked to the reduction of the risk of cardiovascular disease, which is responsible for more deaths worldwide than any other condition. Join us for the next in our webinar digest series to hear Prof. Philip Calder, DSM’s Prof. Manfred Eggersdorfer and Brent MacDonald, discuss how omega-3s can help reduce the risk of cardiovascular disease. Today’s consumer is more health conscious than ever, with 62% being concerned about their current health and 73% worried about their health over the next five years. However, health is a multifaceted topic and primary health concerns can change throughout a person’s life time, meaning their nutritional needs also evolve. Health concerns differ from country to country and range from worries about weight to eye health. Join us on September 15th for our webinar on our new survey, which collected data from almost 7,000 participants across 10 countries in the EMEA region to uncover what the population focuses on the most when it comes to health. Presented by DSM’s Maria Pavlidou, Head of Communications HNH EMEA, and and David Paxton, Senior Global Consumer and Markets Insight Manager, the webinar will discuss the change in health concerns during different life stages and by country, as well as revealing the implications for the supplementation industry. Across the globe, omega-3 intake is lower than recommended by regulatory bodies. This means that a large proportion of the population is missing out on the wide range of health benefits offered by omega-3s. Omega-3s have been linked to the reduction of the risk of cardiovascular disease, which is responsible for more deaths across the world than any other condition. Join us for our new webinar, which will focus on the role of omega-3s in preventing cardiovascular disease. The webinar will be presented by Prof. Philip Calder, Nutritional Immunology at University of Southampton, and he will be joined by DSM’s Prof. Manfred Eggersdorfer and Brent MacDonald. Together, they will discuss current research into the area, the function of omega-3 fatty acids and the latest science of omega-3s in the field of cardiovascular health. Vitamin E is a powerful antioxidant that supports your health; however, intake still remains low among consumers globally. There is an ongoing discussion about the optimal vitamin E status and its role in addressing liver and brain health beyond nutritional recommendations. New and ongoing research suggests that vitamin E at higher doses may help individuals at risk, such as those with age-related macular degeneration, cognitive impairment, and non-alcoholic fatty liver. It is important to revisit the required intake levels for vitamin E for these conditions and further research is needed to support qualified health claims. Join us for the first in our webinar digest series to hear Prof. Jeffrey Blumberg, DSM’s Prof. Manfred Eggersdorfer and Jacob Bauly discuss the emerging health benefits of vitamin E.
This information is solely for scientific informational purposes only and not intended for marketing and/or sales claims purposes. Continued innovation in food fortification is allowing food manufacturers the opportunity to create products that are not only nutritious, but also convenient, cost-effective and appealing to consumers. Information about nutrient density can help identify foods that have a low cost to nutrient ratio and as part of affordable diets that meet nutritional needs. Join us for the second of two webinars on food fortification. This session will focus on the economic benefits of food fortification and nutrient-energy density. The webinar will be presented by Prof. Adam Drewnowski, Professor of Epidemiology, University of Washington, and he will be joined by DSM’s Prof. Manfred Eggersdorfer and Jacob Bauly. They will present the economic benefits that food fortification and nutrient-energy density can provide, share examples of how food fortification can achieve these benefits, and explain how these can be applied to product development. This presentation is developed for scientific information purposes only and is not intended for marketing and/or sales claims purposes. Vitamin C is an essential nutrient with many important functions in the body, such as immune-system stimulation, growth and repair of tissue, cardiovascular health, bone health and neutralizing harmful free radicals. Recent science has highlighted its potential health benefits, reaching far beyond its antioxidant function for which vitamin C is primarily known. As vitamin C is a water-soluble vitamin which the body cannot produce by itself, it must be obtained from the diet or from supplements. Yet, although vitamin C is a common constituent in most fruits and vegetables, many people are still deficient worldwide. Join us on May 19th, so that you can be one of the first to see our new webinar on the role of vitamin C in human health and disease. The session will be presented by Prof. Jens Lykkesfeldt, Faculty of Health & Medical Sciences at University of Copenhagen, and he will be joined by DSM’s Prof. Manfred Eggersdorfer and Jacob Bauly. Together, they will discuss the science behind vitamin C, provide examples of its key known functions, as well as share the potential health benefits of consuming it in higher doses. If you miss the first showing, don’t worry - the webinar will also be made available on demand.